Looking for a quiet, peaceful beach day without the busy crowds of the popular Siesta Key beach? Lido Beach, located in Lido Key, may just be your paradise beach vacation! Famous for its white, powdery sand, Lido Beach is popular with Florida locals looking for a getaway from its busy neighbor, Siesta Key. The long and narrow beach allows for more room to stretch out on the sand and enjoy the water. Concessions and restrooms are available, and the parking is free, more plentiful than Siesta, and is an easy, short walk to the water. The warm, clear water of Lido Beach is the perfect spot to look for interesting shells and sand dollars, take in the breathtaking scenery, and maybe even catch a glimpse of some dolphins. Some locals suggest going out to the sandbar during low tide to do some sea exploring. This is where you’ll find the best sand dollars and can see some schools of fish. Don’t forget to see a gorgeous, Florida sunset while enjoying this beach. Even the locals say it’s one of the best spots to see it. One other perk of Lido Beach is that it’s walking distance to St. Armand’s Circle, known for its unique shops and boutiques. The Circle a great place to grab a bite to eat or get some ice cream with the kids after a long day of enjoying the beach. The Circle offers plenty of places to sit and relax while planning your next activity. 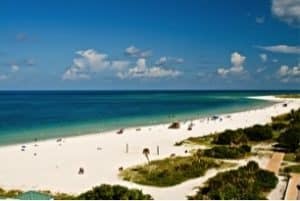 When you’re ready to start looking for a Lido Key beach rental property, Jennette Properties has some great beachfront rentals that will put you right in view of this gorgeous beach. Contact us today!